Announces Coffee Coaching Sessions for the Remainder of 2016. Coffee Coaching has been a great tool for CDCC Members. Within one hour, a participant of the Coffee Coaching Program can gain relevant information that is needed to help grow their business! Coffee Coaching is FREE for all CDCC Members and $25 for non-members. October’s Coffee Coaching session is one you won’t want to miss. On Wednesday, October 12th attendees will pack the CDCC Board Room from 8am-9am to gain knowledge about taxes, accounting, and strategies for your business. 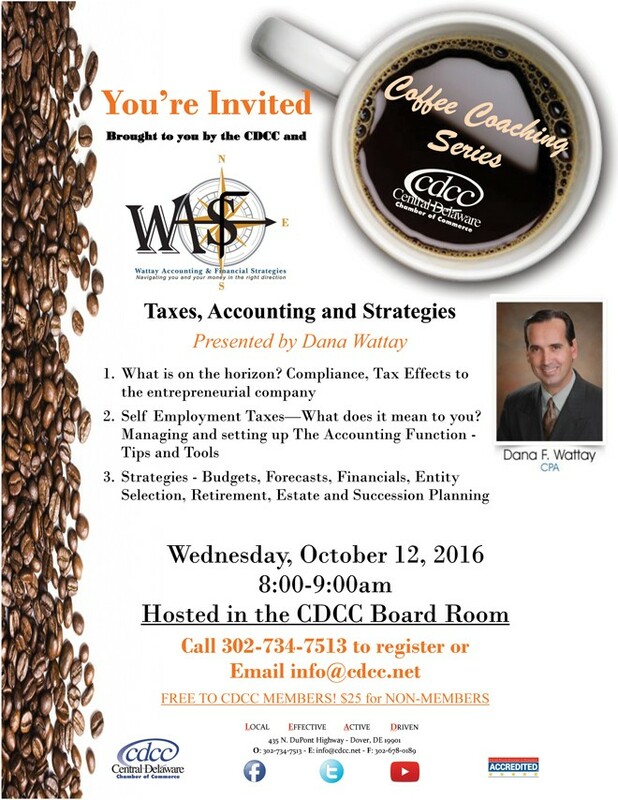 Wattay Accounting and Financial Strategies’ Dana Wattay will present to attendees all about compliance, what’s on the horizon, and all about self-employment taxes. Wattay will close with a discussion about strategies with budgeting, forecasts, financials, and more. The last Coffee Coaching session of 2016 will take place on November 9th. Don’t worry – Coffee Coaching will pick back up in January of 2017! The Central Delaware Chamber of Commerce’s President, Judy Diogo, will present to attendees from 8am-9am. Visit cdcc.net to learn more about the Coffee Coaching Program. If you have any questions, want to register for either of these sessions, or would like to present at a Coffee Coaching session call (302) 734-7513. The CDCC looks forward to helping your business grow!